MSU BILLINGS NEWS — Montana State University Billings is teaming up with the South Side Neighborhood Task Force for the Annual South Park Easter Egg Hunt on Saturday, April 20 at 12 p.m.
All are welcome to attend this family-friendly event. All children under the age of 12 may participate in the hunt for toys, candy, and many great prizes. MSU Billings is providing a number of student volunteers coordinated through the Center for Engagement to assist with the event. A costumed bunny will be on hand to take photos and interact with participants. 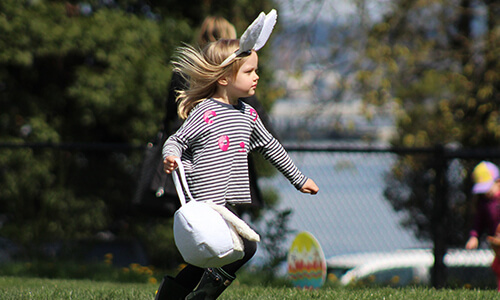 Partnering with the South Side Neighborhood Task Force for this community egg hunt was a logical decision made by MSUB, which allows the university the opportunity to work hand-in-hand with a community partner and to not compete with other egg hunt opportunities in the area. Hop on over to South Park, located at South Broadway and 6th Avenue South for all the egg-citement! For more information, contact South Side Neighborhood Task Force Secretary Mary Westwood at 259-3756.